Tired of being underestimated, a furniture maker opens a spacious workshop with no room for gender bias. Published on Monday, January 8, 2018. This article appears in the December/January 2018 issue of American Craft Magazine. Sarah Marriage launched A Workshop of Our Own in 2016 in Baltimore, offering studio space, community shop hours, and woodworking classes. Sometimes I wonder how my career came to be so intertwined with gender. When I finished woodworking school at the College of the Redwoods and struck out on my own as a furniture maker, the last thing I wanted was to call attention to my gender. I see myself as a woodworker, a furniture maker. It turns out that others have seen me as a woman woodworker, a woman furniture maker. To be honest, though I didn’t always fit in, I never felt uncomfortable in all-male environments or uncomfortable about who I am. That is, until I started making furniture professionally. My discomfort began with others’ little comments of surprise and disbelief. At my final student exhibition, I heard confused whispers: “A girl made this? !” Then, as I stood below the banner with my name on it at my first solo booth at a craft show, an older woman asked, “Did your husband make the furniture?” Another female furniture maker and I were once prevented from entering a lumberyard until we explained firmly that we did indeed know where we were. A woman came to my shop looking for apprenticeship opportunities after she was turned down for a job that required no experience – because it was assumed that a woman with no experience somehow has less experience than a man with no experience. And not long ago, I stood by the booth of a woman furniture maker and heard an older man ask if he could touch her, since the sign said customers were encouraged to touch everything. My female furniture-maker friends and I have countless stories like these, not all of them appropriate for this magazine. There is a general and relentless underlying expectation that somehow our physiology plays a role in our ability to cut wood and glue it back together in a manner that is careful, artful, and structurally sound. That underlying expectation is exhausting. It’s men staring at you as you use a table saw because they’re worried for you, even though you’ve logged thousands of hours on that machine. It’s being scrutinized for any mistake – maybe something as common as using a driver before realizing it was set to reverse, and then flipping the switch to the right direction. It’s well-meaning supporters still amazed that a person with breasts is doing this work. And it’s internet trolls making lewd comments. This bias isn’t new, of course. And it’s not engineered by male woodworkers or showgoers. It’s embedded in our culture. It’s born of hundreds of years of calcifying gender roles and socioeconomic structures. My generation didn’t originate the problem. But that doesn’t mean it’s not our job to fix it. That’s why last year I founded A Workshop of Our Own (WOO for short), in the Woodberry neighborhood of Baltimore. WOO, whose name is an homage to Virginia Woolf’s essay A Room of One’s Own, is an educational woodshop created by and for women and non-binary people (those who identify as neither male nor female). We have studio space for up to four “professionals in residence” to run their furniture businesses, and we offer classes and open shop hours on nights and weekends. 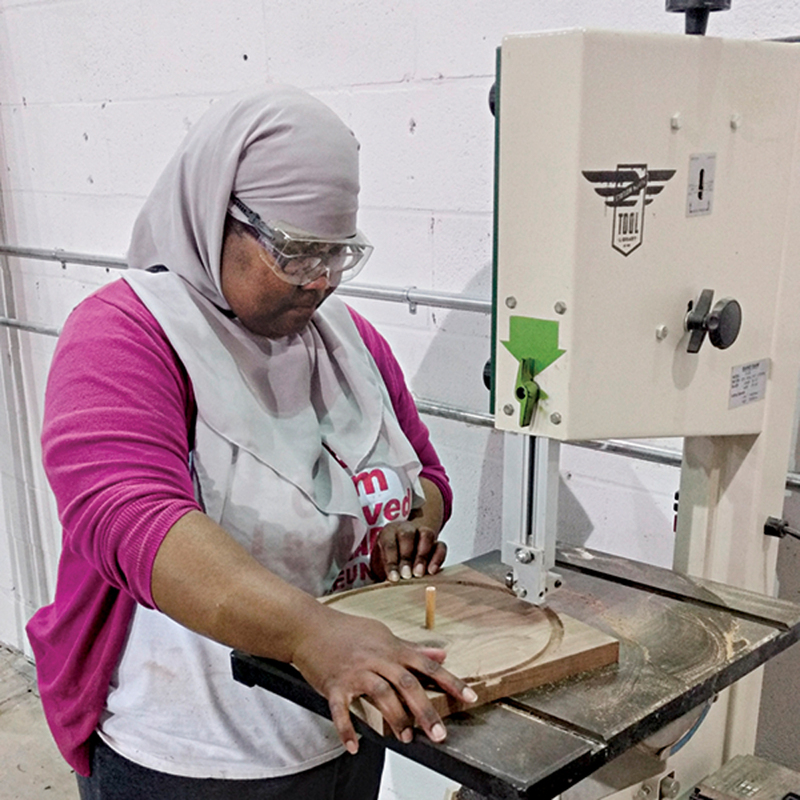 “I’ve always wanted to learn the basics of furniture making,” one of our students says, “but male-dominated shops are incredibly intimidating, so I never seriously considered taking a class.” That sentiment is echoed by others. Male woodworking friends of mine have said they would hire women if they applied for the jobs they post, but women just aren’t applying. WOO put out a call for woodworking interns, and our inbox was flooded. Women who want to work in woodworking are out there, and shops like ours can help train them and connect them to their next jobs. We’re part of a movement. Activist woodshops are growing in number in the United States and across the globe, building on the principle that representation matters. We need to become accustomed to women and non-binary people doing this work, to change expectations and encourage greater participation in the field. 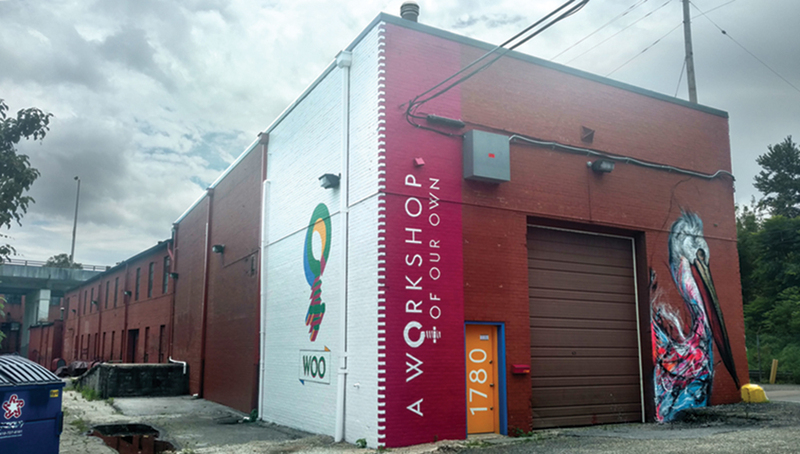 The true magic of a place like WOO is that it allows women to become woodworkers. 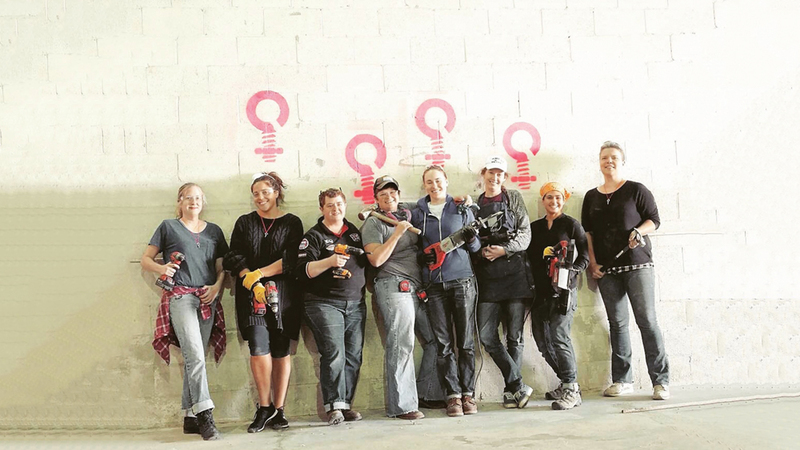 Not women woodworkers, not trans woodworkers, not non-binary woodworkers – just woodworkers. It offers freedom from unequal scrutiny and from biased expectations. And with that freedom comes creativity, strength, and change. Jamillah Muhammad, a baker, learns how to build a cake stand at a WOO class she suggested. Volunteers take a break from demolition in the early stages of fixing up the 6,400-square-foot shop in a former industrial mill. Marriage organized parties to paint the Baltimore workshop. The names of donors are painted on an inside wall.